In large microwavable bowl, microwave cream cheese and icing sugar uncovered on High 30 to 60 seconds, stirring after 30 seconds, until softened. Stir until smooth. Stir in blueberries and 1 tablespoon of the lemon zest. Separate dough into 5 rolls; return icing to refrigerator. Cut each roll into 6 pieces; stir into berry mixture. Spoon and arrange in baking dish. Bake 34 to 38 minutes or until bubbling around edges and dough is baked through in centre. Cool 10 minutes. Transfer reserved icing to small bowl, stir in remaining 1 tablespoon lemon zest. Spoon icing mixture into small resealable food-storage plastic bag; partially seal bag. Cut off tiny corner of bag; squeeze bag to pipe over top of breakfast bake. Serve warm. 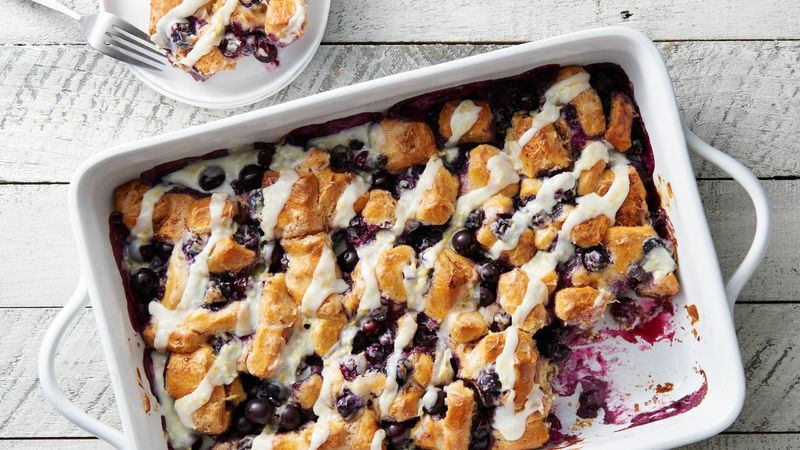 Breakfast bake is best served the same day. Cutting the cinnamon roll dough into sixths helps the dough bake all the way through.